One of the most important things to keep in mind when using a reusable straw is cleanliness & sanitation. If your straw isn’t clean, you and your kids are literally drinking through a tube which is lined with bacteria and food debris… and that’s no good. So, with that in mind — what is the best way to clean your reusable straws? The best ways to clean reusable straws are with a cleaning tool, dishwasher, or (depending on the straw material) by boiling. Many straw brands offer a small metal “pipe cleaner” looking tool with nylon bristles. We feel we have a better idea. We are the only straw brand to offer our patent pending Straw Squeegee® — a silicone straw cleaner specifically designed to get all the gunk out the inside of your straws, without scratching the straw. 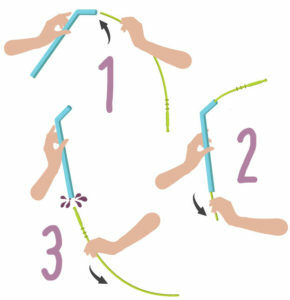 After using your Softy Straws, you run the Squeegee through the straw to remove any debris that may remain. (It’s easy, it’s fun, and it gets all the junk out, better than a brush.) Then you sanitize the straws and Squeegee by either washing the straws and Squeegee in hot soapy water, boiling them in water, or put them in your dishwasher. None of these methods of cleaning will harm the silicone. And, you can repeat this process over and over again. Softy Straws, is the only company that offers a quality cleaning device such as the Squeegee. As mentioned above, there are some offerings of a “pipe cleaning” type tool. However, these brushes not only do NOT remove the contaminants nearly as well as the Squeegee, but they can scratch the interior of your straws and make them more unsanitary for future use. The result is bacteria growth in your straws. Our Straw Squeegee® is not abrasive and will not harm the integrity of reusable straw inner walls. Because we have such high quality control, we readily stand behind all our products and will respond quickly to any questions or concerns. Thank you for your interest, we hope you enjoy our products.